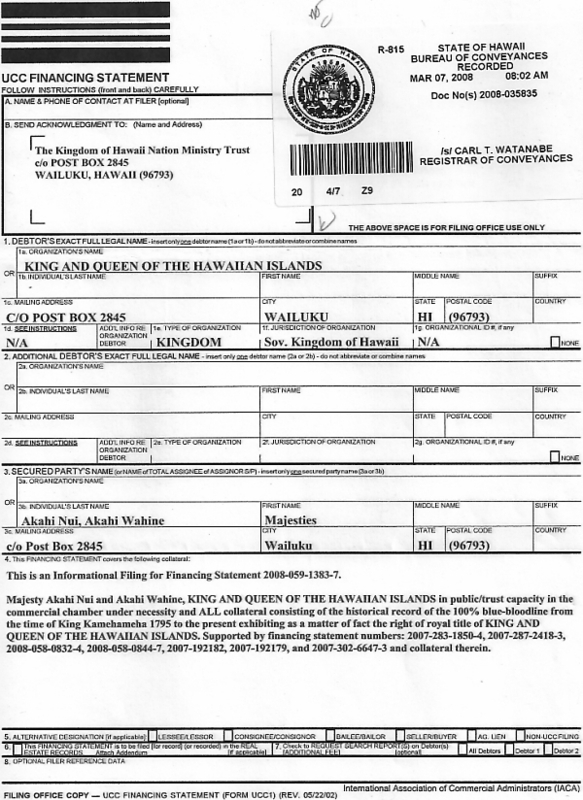 Claimant: His Royal Majesty Akahi Nui, Authorized Representative in behalf of THE KINGDOM OF HAWAII NATION MINISTRY TRUST. Date of Alleged Occurrence: March 30, 2001 and on going. 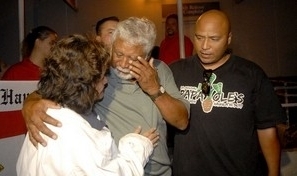 Hawai'i Kingdom Majesty Akahi Nui, center, greets his wife, Akahi Wahine, after her release from the main police station. Said Tort Claim is presented as a matter of right, arising out of private injuries and violations of due process of Law, International Law, and the Law of Nations and is in violation of United States Public Law 130-150 [103d Congress Joint Resolution], fraud, and dishonor, treasonous acts, and otherwise as set out below, thereby causing injury to Claimant's Right to Life, Liberty, and Pursuit of Happiness, and otherwise. You are hereby notified of 'Notice of Tort Claim' as 'Lien Claimants' exclusive remedy pursuant to Title 5, Section 2679(b) of Title 28, United States Code (P.L. 100-694; 102 Stat. 4563; 28 U.S.C. 2671(note), 2674, 2679(note), 2679b and d) and state statute, where applicable, under the Pari Materia Rule. In respect to the Tort Claim being the exclusive remedy, and in respect to all the matters heretofore agreed upon by Linda Lingle/ Tort Feasor, pursuant to the full agreement of the particulars contained in the Conditional Acceptance, Tort Feasor has by her silence agreed to the facts. THE OFFICE OF GOVERNOR OF THE STATE OF HAWAII by and through it's agent LINDA LINGLE whether fully bonded or not, is completely financially responsible to financially cover, settle and pay any wrong doing that has occurred by negligence, reckless misconduct, and any actions that are in direct violation of the rights of the Undersigned. 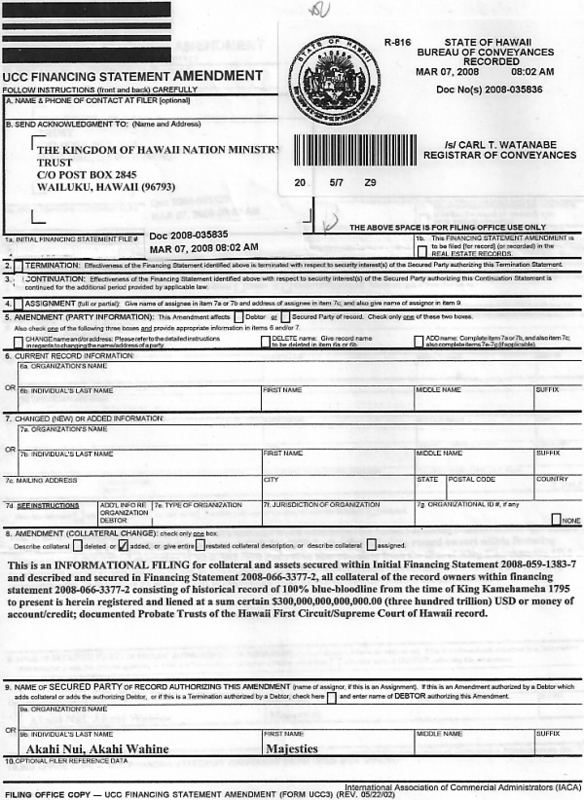 Pursuant to the Private Administrative Process i.e., Conditional Acceptance, in that it specifically addressed the particulars pertaining to the relationship that the Undersigned has to the Kingdom of Hawai'i Nation Ministry Trust, the state of Hawaii, and/or Republic of Hawaii and evidence was not brought forth that documented that Linda Lingle, as acting Governor for the state of Hawaii, in collusion with Alexander & Baldwin, Inc.(aka, A&B), or any other 'entity' holds or does have lawful Title/Claim of Deed/Writ of Possession to any land or property within the state of Hawaii, Republic of Hawaii, and Kingdom of Hawai'i Nation; evidence was not brought forth that Alexander & Baldwin is not in error or not operating in fraud by claiming to have Title to property described in Financing Statement's 2007-198182 and 2007-287-2418-3 and have given or gave full disclosure to the alleged acquired titles/deeds/quiet title actions/quick claim deeds and any contract(s) that were signed throughout the history of the alleged title/contracts. By the Rule of Acquiescence Linda Lingle's silence therein has stipulated and agreed that what the Undersigned has proclaimed as total sovereign jurisdiction over all aspects of himself, the state of Hawaii, Republic of Hawaii, and The Kingdom of Hawai'i Nation©, as well as being the fiduciary of the corporate fiction, THE KINGDOM OF HAWAI' I NATIONAL MINISTRY TRUST©, and that his sovereign status existed long before the creation of the state of Hawaii. 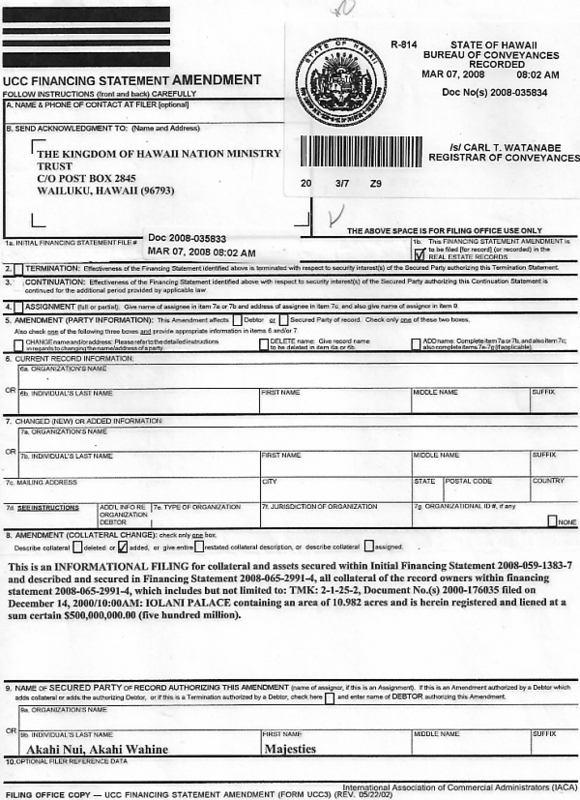 Further stipulated by her silence, Linda Lingle has declared that she has not acted honorably by investigating all the facts before making decisions, choices, and/or orders and does have a conflict of interest in such by perceiving to own land within the Sovereign Kingdom of Hawaii and that in behalf of THE GOVERNORS OFFICE, that there has been fraud on any claim of title or action(s), and of any unconscionable contract affecting any such land and/or the Sovereign Kingdom of Hawai i, that you and/or your office did not in fact have a meeting of the minds with The Kingdom of Hawai'i Ministry Trust, the lawful Heirs of the Sovereign Hawaiian Islands and Holders in Due Course of the Allodial Patent Lands therein, and proof of claim as to any agreement, contract, lease, rental agreement(s), Political representation and that by lawful or legal authority such agency denies dominion over the Sovereign Hawaii Islands to the said Heirs and of the release and replevin of the said lands and Islands that constitute the Sovereign Kingdom of Hawai i to the lawful Heir. The Tort Feasor has further declared that the United States, via its Public Law 103-150, the CLAIM/WRIT OF POSSESSION as sent by Alexander & Baldwin, Inc.(aka, A&B) initially dated April 4th, 2007 with an extension dated September 26th, 2007 would not have any authority over the above named property mentioned within Financing Statement No. 2007-287-2418-3 and 2007-192182 and IS IN DIRECT VIOLATION AND CONTRADICTION OF THE ALLODIAL PATENT LANDS AND THE LAWFUL HEIR [See exhibits]. By the Rule of Acquiescence Linda Lingle's silence for the particular claims in the Private Administrative Process i.e., Conditional Acceptance and upon her dishonor and admission to the injuries, as acting Governor to the State of Hawaii, she herein binds the Corporation; the de facto-STATE OF HAWAII and Alexander & Baldwin, Inc. (aka, A&B) along with herself, for financial compensation to compensate for said injuries against the Undersigned. Linda Lingle has further declared Majesty Akahi Nui, does have Right of Entry, Right of Possession, 100% Ownership and a $500,000,000.00 (Five-Hundred-Million) Security Interest (lien) documented within Financing Statements: 2008-059-1383-7; 2008-035834 and 2008-035833 to the IOLANI PALACE and that Majesty Akahi Nui, is a direct descendant of King Kamehameha III who does have a lawful Right, as 100% Blue Blood Lineal Heir to the Kingdom of Hawaii, to be in full control and Rein as Sovereign King over all of the Kingdom of Hawai i Nation, including but not limited to every acre of said soil, land and property of and within these Hawaiian Islands therefore; Linda Lingle in acting in the corporate capacity as governor, is in error and operating in fraud by claiming to have lawful authority to endorse, act for, sign for, assign, and/or otherwise speak on the behalf of the Kingdom of Hawaii Nation or its people. Linda Lingle has agreed that full disclosure as to the alleged acquirement of the title/deed/ Royal Patent Deed/ Contract and monetary conditions were disclosed and that the rightful holders of the above named property are in fact The Kingdom of Hawai'i Nation Ministry Trust by and through Majesty Akahi Nui and Akahi Wahine and the continued seizure of the above named property is only in place to be of financial and personal benefit to the Corporation, especially, Linda Lingle, Tort Feasor, who benefits financially/commercially. Mrs. Linda Lingle acted with reckless disregard with reference to the truth and facts of the case and situation. Mrs. Lingle acted negligently and with malice blatantly refusing to acknowledge the truth and facts in this case. By admission, via her silent tacit agreement, Linda Lingle has agreed that the entire package of false documents pertaining to Alexander & Baldwin's Claim of inferior Title/writ of Deed, was of her own creation, and was a set-up to maintain control financially/commercially/personally over the above named property. The presumption is that Linda Lingle in a concerted action with Alexander & Baldwin and Corporation de facto- THE STATE OF HAWAII is in collusion to injure and deprive Tort Claimant as the sovereign authority of an independent Kingdom of Hawai'i Nation, ignoring the United States Public Law 103-150, 103d Congress Joint Resolution 19, Charter of the U.N. at Article 73. Linda Lingle has a mandated duty by her 'Oath of Office' to uphold the sanctity of the Supreme law as it pertains to the Undersigned. 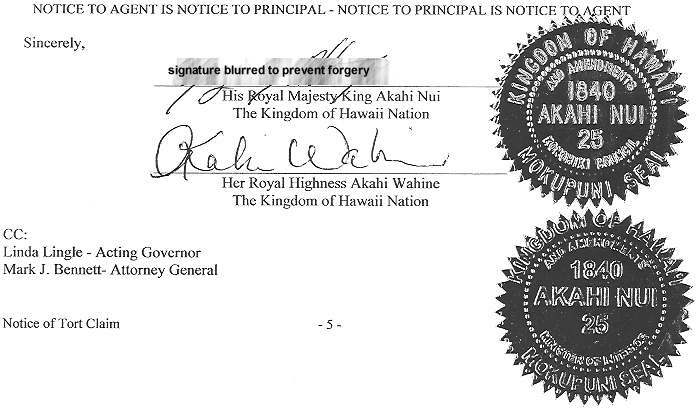 She has breached her agreement pertaining to her mandated duties pursuant to the direct violations of the Undersigned's rights as the rightful heir through 100% Blue Blood lineage to the Kingdom of Hawaii, knowingly overlooked evidence pertaining to the rightful acquirement of the above named property, pertaining to the violation of due process, civil rights, and fraud. That breach has violated the said secured rights of the Tort Claimant, thus causing direct injury to the Undersigned. or refused to enforce the validity of evidence regarding the acquirement of the title/deed/ Royal Patent Deed/ Contract thereby committing constitutional impermissible violation in respect to the rights of THE KINGDOM OF HAWAI'I NATIONAL MINISTRY TRUST© via the Undersigned, and the 'Political Will' [The Right to Life, Liberty and Pursuit of Happiness] of the Undersigned as the surety and Principle, in a political body which all officers and elected officials have sworn to protect, in the interest of the Undersigned's rights, titles, interests, and property. The Tort Claimant herein files this Claim for Damages under necessity, for the injuries committed by the 'agents'/agency identified above as Tort Feasor, working under the control of de facto state of Hawaii, in collusion with ALEXANDER & BALDWIN INC., herein identified, as a matter of right, and such Claim for Damages arising out of violations as stated within Tort, and as agreed and stipulated by the Tort Feasor, Linda Lingle, as evidenced and attached hereto, thereby admitting, stipulating, confessing and agreement to causing injury to claimants' private rights, property, due process of law/rights, peace of mind and otherwise to wit: The following injuries have occurred: Through your malicious and reckless actions you have conspired to bring forward direct harm to the Undersigned; Coercion, Detriment of Character, Battery, Emotional Physical and Mental Anguish, Obstruction of Justice, Unlawful Intrusion on Personal Property, Unlawful fraud on the contract, Misapplication of the Statutes, malice and negligence and Violation of United States Public Law 130-150 [103d Congress Joint Resolution], violation of International Law, acts of treason and are in violation of the 6th Constitution. ALSO, Linda Lingle, by and through acting Governor for the de facto STATE OF HAWAII and in collusion with Alexander & Baldwin, have, by and through her failure to give full disclosure to the alleged acquired inferior title/deed/ Royal Patent Deed/ Contracts and monetary conditions, misapplication of the statutes, violation of Due Process of law, unlawful possession of the above named property, and clear abuse of process, and by your wanton and reckless actions you have caused undue and possible permanent injury, commercial injury and personal injury to the Claimant and also to yourself. Said mandatory duty of the Linda Lingle/ Tort Feasor via her Oath of Office as acting Governor for the defacto state of Hawaii and via the acts made and done to and upon Claimant, constituted a breach of that 'Oath.' Pursuant to that breach, such matters were brought to the attention of Linda Lingle /Tort Feasor, and she was given opportunity to bring forth 'Proof(s) of Claim' that such duty, breach, or injury was not committed against the Claimant and said Tort Feasor went silent and failed and refused to bring forth 'Proof(s) of Claim' to the contrary and therefore stipulated, agreed and confessed to the acts, violations, and admission/confession of fraud on the contract/actions, etc. and did breach her mandated duty which, such breach of her mandated duty caused injury to the Tort Claimant as stated herein and herein Tort Claimant states claim for said injuries herein as supported by two Affidavits: Affidavit of Negative Averment, and Affidavit of Truth, both in support of said Tort Claim, with Assessment of Damages. Such Affidavits are Annexed in and attached and hereto are made a part hereof [see exhibit]. NOTE: The Tort Claim Notice and all affidavits must be responded and rebutted within 30 days upon receipt or otherwise all facts stand in the record as true and the state of Hawaii, in collusion with ALEXANDER & BALDWIN INC., by and through Linda Lingle-as acting Governor for the defacto state of Hawaii and speaks for the state of Hawaii. Due to the silence of the Tort Feasor/ Linda Lingle binds the liability and assets of said Corporation; defacto state of Hawaii via their claim to the benefit of the Tort Claimant/ Majesty Akahi Nui and The Kingdom of Hawai'i Nation Ministry Trust in the nature of a debt due and owing. Joint Resolution], Bill of Rights and the first ten Amendments to the Constitution including but not limited to Article 12 section 7 of the Constitution for The State of Hawaii as it/they operate upon the 'agents' of the defacto state of Hawaii, Alexander & Baldwin and yourself. WHEREFORE Claimant herein claims Monetary Damages as real and appropriate pursuant to Tort Claimant's Tort Claim as supported by affidavit(s) attached hereto and made a part hereof, ANNEXES of Tort Claimants exhaustion of private administrative remedy and relative to all the acts, the conspiratorial acts with intent to defraud, fraud, fraud by device, fraud by scienter, and or otherwise in respect to Tort Claimant's rights and property herein expressed and there being no response or rebuttal; but only silence (acquiescence and agreement) and refusal to provide 'Proof(s) of Claim' from said Tort Feasors being mere 'agents' of the state of Hawaii, in collusion with Alexander & Baldwin Inc., and being accountable in this matter for the acts of its 'agents'; herein said injures against the rights, title and interest of the Tort Claimant and Tort Claimant herein being attested to under necessity, claims monetary damages as real and appropriate as so enumerated herein and assessed for cause; at a SUM CERTAIN of $432,000,000.00 (four hundred and thirty-two million dollars) USD Money, or money of account/credit. PRE-SETTLEMENT OFFER; In the event that by and through Risk Management fails and/or refuses to respond to the Notice of Tort Claim, supported by Affidavit in Support of Tort Claim and the Affidavit of Negative Averment and that said Affidavits are not rebutted and therein the claim and the facts stand in the record as true and the same as to the claim in the above declared sum certain amount, said Tort Claimant herein presents, in honor, pre-settlement offer for your consideration and acceptance within an additional 10 days, to wit; 1) PAY 25% OF THE TOTAL AMOUNT AS CLAIMED ABOVE, 2) VACATE and DISSOLVE ANY WORKING CONTRACT WITH DEFACTO STATE OF HAWAII, AND IN COLLUSON WITH ALEXANDER AND BALDWIN INC., including ceasing to be associated with any and all land or property dispute's in association with the Hawaiian Islands and 3) RELEASE THE COLLATERAL; Quit Claim Deed/ Writ of Possession/Title to property at Zone-(3) District-(8) PUUNENE-AIRPORT (T.M.K. (2) 3-8-008-019-Doc No. (s)2002 005579 through 2002-005580 T.M.K. (2)-1 through 6 ALL-ALL-ALL(ROYAL PATENT DEED) constituting the Kingdom of Hawai'i, all land and property recorded and filed within Financing Statement No. : 2007-287-2418-3 and 2007-192182, or face the liability (silence equates to agreement) of whole amount sum certain if not paid, settled and released on the 15th day from receipt of their Notice of Tort Claim. So as it is written, so shall it be done.